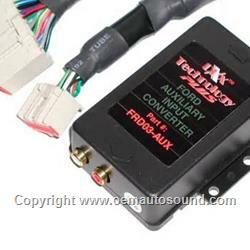 The PIE FRD03-AUX Auxiliary Input Converter converts the CD-changer port of your Oem factory Ford Lincoln Radio into an auxiliary input. With this converter installed, you can now connect any device that has RCA outputs. Such as an iPod, Mp3 player, satellite radios or any auxiliary audio device directly to your car radio without using an FM modulator. 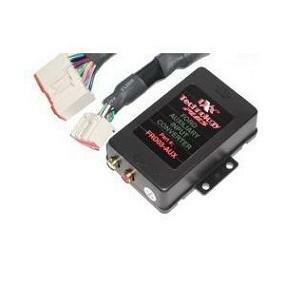 Compatible with all vehicles listed below that are equipped with the "Phase II" style CD-changer controlling factory radio with 16- & 24-pin connectors. The FRD03-AUX connects at the rear of the factory radio plugging into the 16- and 24-pin connectors located there. Ford radio must have a CD/Aux button. If the factory external CD-changer is present, you will need to disconnect it from the factory harness.Not compatible with 2003-2005 vehicles equipped with the 6-Disc in-dash head unit that are not equipped with external CD-changer capabilities. Not compatible with vehicles with Ford's "1st generation" factory navigation system with the single disc CD player.